← Would you believe it? . . . more flower photos! I mentioned I’d walked to the shore a couple of times. Snapped me some decent photos (which I can’t share because — whaaa! — I ain’t got my PC to download them. However, I did record a few videos with the Samsung Note 8. One thing to note with these videos is they’re shot after sunset. In fact, well after sunset. I was surprised the captures worked as well as they did. Remember to watch them in HD. This first video is the longest, clocking in at 2:32 . . . but you can choose to speed it up using the settings. Or, you can choose to skip it altogether. They are not large waves . . . or are they? There’s no sense of scale here. For all viewers know, those rocks are hundreds of feet tall and the waves tower over them. Alas, they aren’t and they don’t. I figure most of these were in the 4-5 feet range. The reason I was out there is that the canoe replica was supposed to leave Kona around that time. What canoe replica, you ask? Like me, you’ll have to wait for the answer until I get the PC up and running. Notice that as the light gets poorer, the quality of the videos deteriorates . . . but still pretty good when you consider that I could hardly see. Obviously, the HDR function in the camera is better than the HDR capability of my eyes. Also, as the effect of the sun lessened, the wind began to slow and the waves began to subside. There were three more videos after this next one but the light had, by then, packed up and done left me there with my camera shooting vague white shapes that must have been waves breaking but that — for all I knew given the sound — were banshees making susurrant noises as they ambled onshore from the depths of the ocean. However, we did go back there yesterday evening before sunset and managed one good capture. Those were the last two waves before the ocean quieted down. It seems odd posting nothing but videos . . . here’s a photo from Florida, the Pensacola beach. It looks like a golden pineapple, but it’s actually a young palm. 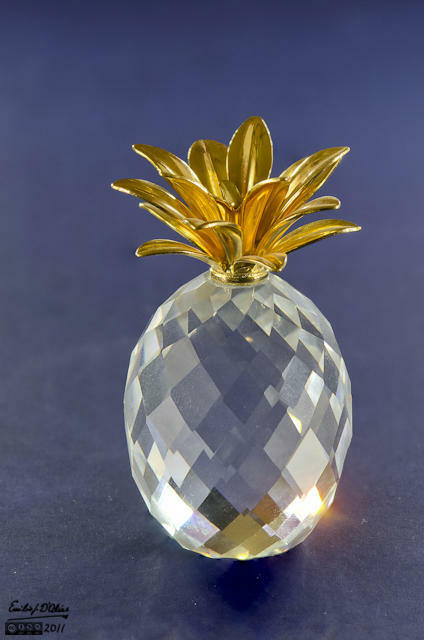 Here’s a crystal/gold pineapple from a post long ago . . .
That’s from my blended layer post (HERE). This entry was posted in My YouTube, YouTube Stuff and tagged Big Island - Hawaii, Kailua-Kona, Photography, Samsung Note 8, slow-motion, Videos, Waves. Bookmark the permalink. The book is better than the movie. Paul Theroux is both a travel writer and a novelist. He has also published several short story collections. He is often critical of local governments and consequently some of his books have been banned by those governments. The movie had promise and I thought it went off the rails about hafway through. It wasn’t executed well because the chaange in the personality of the character was too drastic. It made it difficult to understand the motivation and obsession (other than, perhaps, personal pride). I’ll likely not read the book as I seldom read books after watching a movie of the same. I don’t have a problem going the other way (read book, watch movie) but even then, it’s not preferred. Still like the music, though. We both like the look of them (the crystal ones). Real life pineapples are also nice. I trust you’re doing reasonably well? You seem somewhat subdued, of late. Well, I’m sorry to hear. Perhaps you should start a project or a quest or have some goal involving a time span and intellectual challenge. Something that will help stimulate your interest and gets you motivated. As for hating the computer, I can tell you that hate is one of them things that’s often reciprocated . . . have you tried loving it? I really enjoy the slow motion ones! 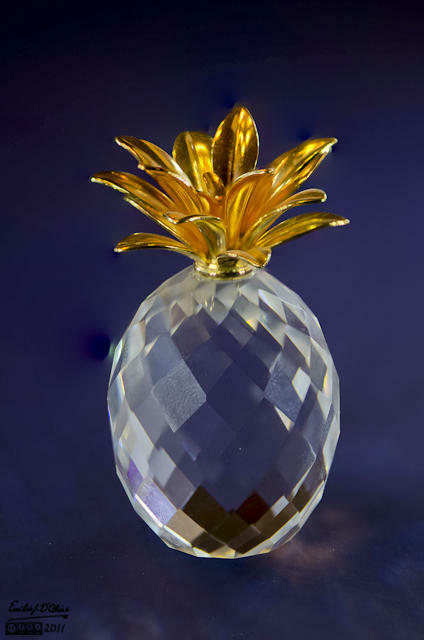 The fancy pineapple is royal AND cute. I like the real-life ones even more. That music is so soothing! I think I could fall asleep to that. Thank you, diem3. I can spend hours watching waves and thinking each new one offers a better shot than the last one. It is nice music, especially after the transition. The first two wave videos have super excellent colors! They gave even more pleasure in watching the waves . . . very nice, E! And your pineapple-palm shot is enchantingly lovely!!! I find myself more often than not playing with the photos . . . Thanks.